The follows are notes on various tilings on the plane. 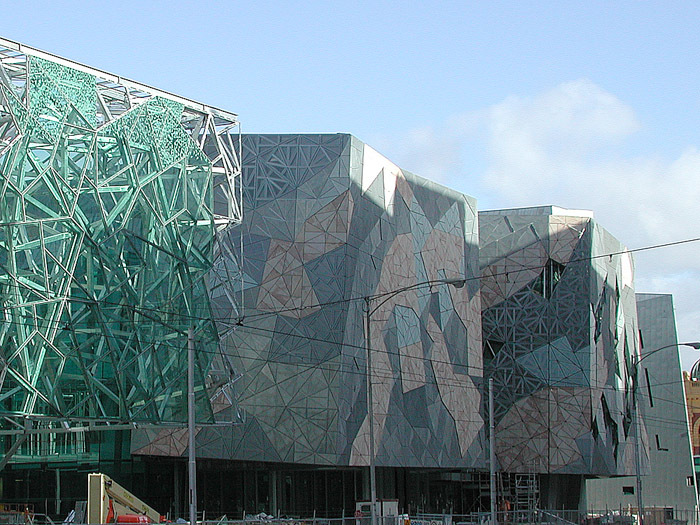 Named after Sebastien Truchet (1657 - 1729) who studied tiling of squares with a diagonal orientation. 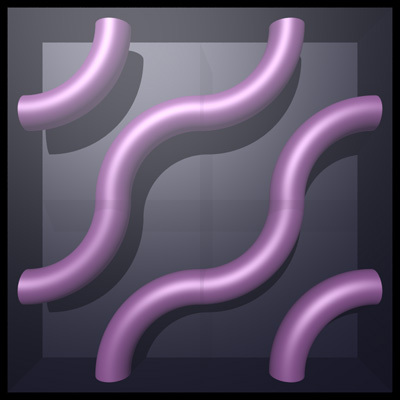 Each unit is randomly rotated by 0 or 90 degrees or flipped vertically or horizontally, there are only two unit states. Each unit is randomly rotated by integer multiples of 90 degrees about each axis and randomly mirrored about each Cartesian axis plane (xy, xz, yz). 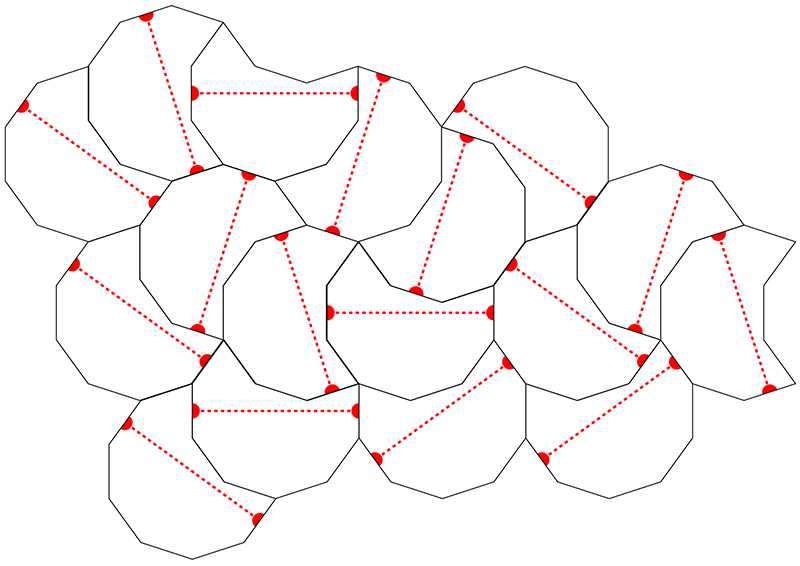 Single tiling unit (Unit square in red). Perspective view of single tiling unit. 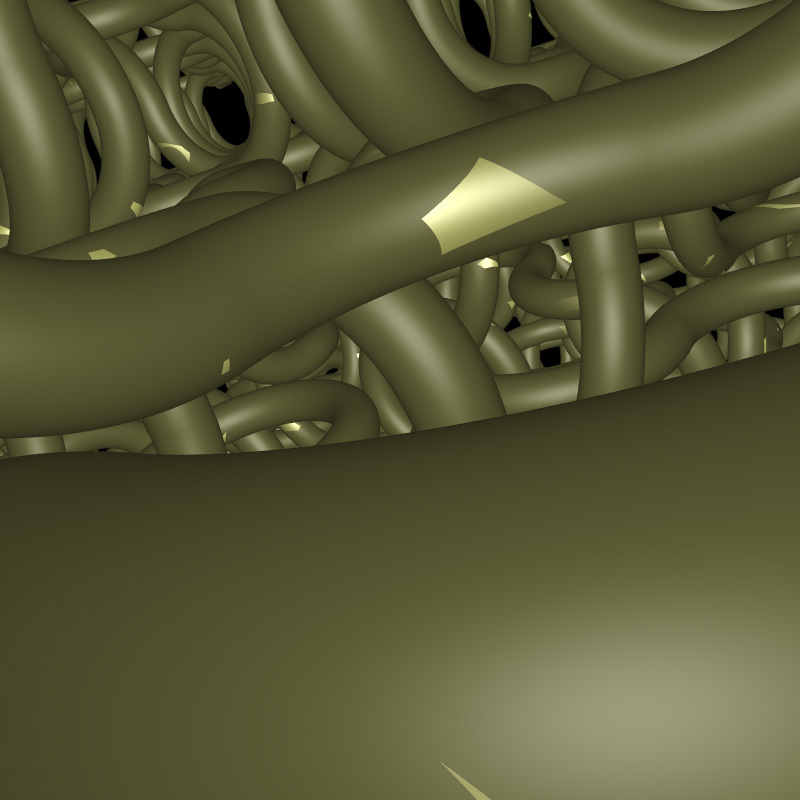 Perspective view of the randomized tiling. POVRay scene file: weave.pov for the single unit. 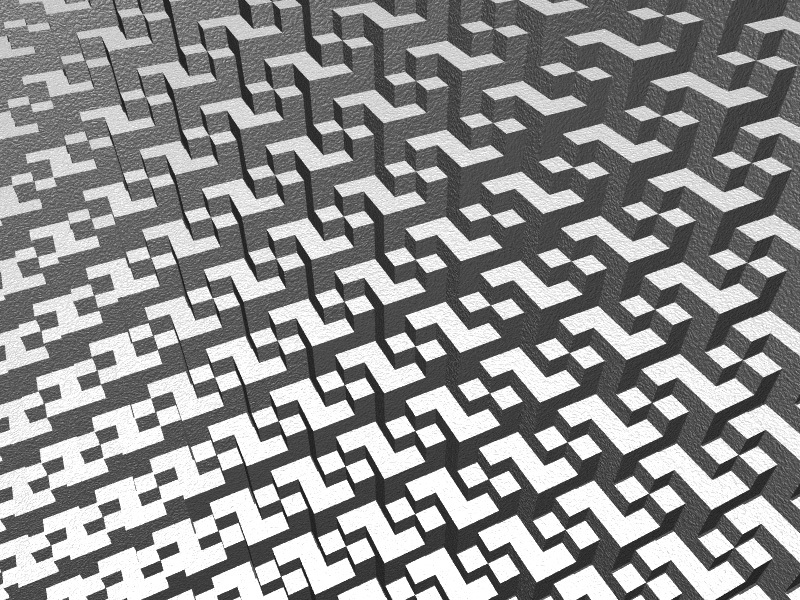 Scene file for a random tiling of the plane: weave.pov. Of the three 2 dimensional shapes (equilateral triangle, rectangle, and hexagon) that can be used to tile the plane without holes, the hexagon is the most complex and has many interesting properties. 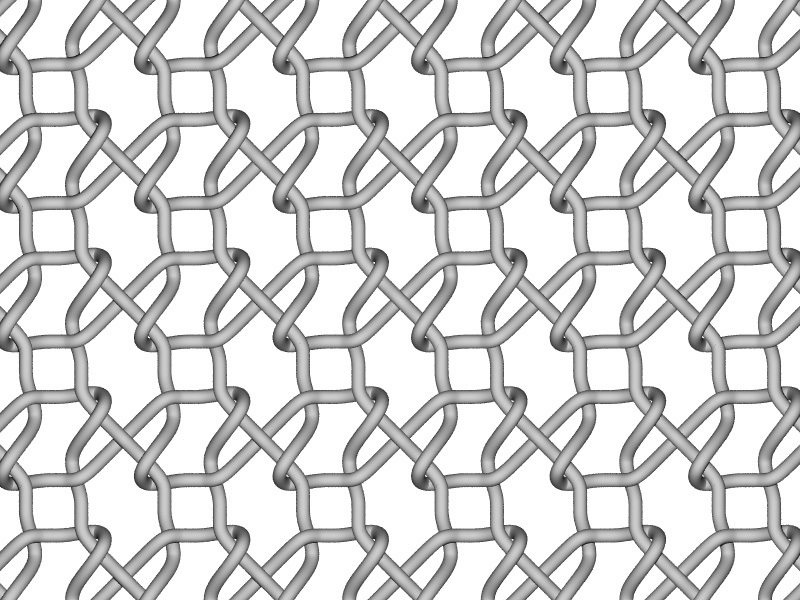 In what follows, an indexing system will be described for a hexagonal tiling called a Spiral Honeycomb Mosaic (SHM). 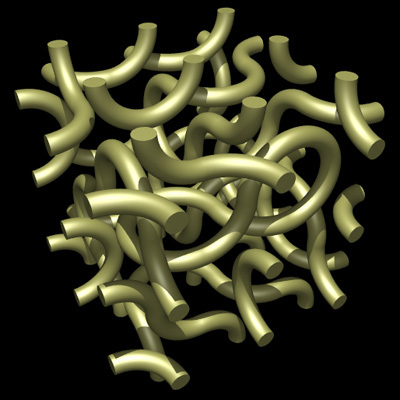 A SHM consists of groups of 7n hexagons (n > 0) called super-hexagons. 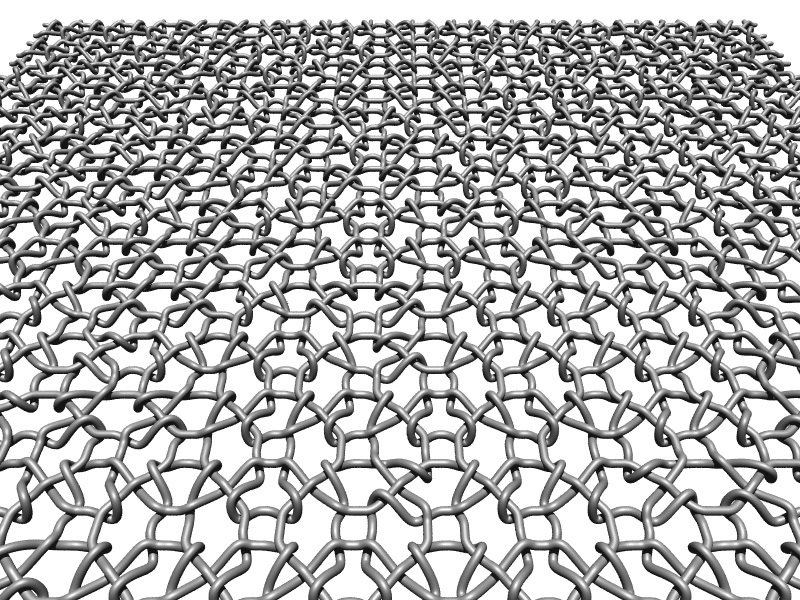 It uses a base 7 numbering system for the hexagonal mesh, this is illustrated below for n = 1, 2, and 3. 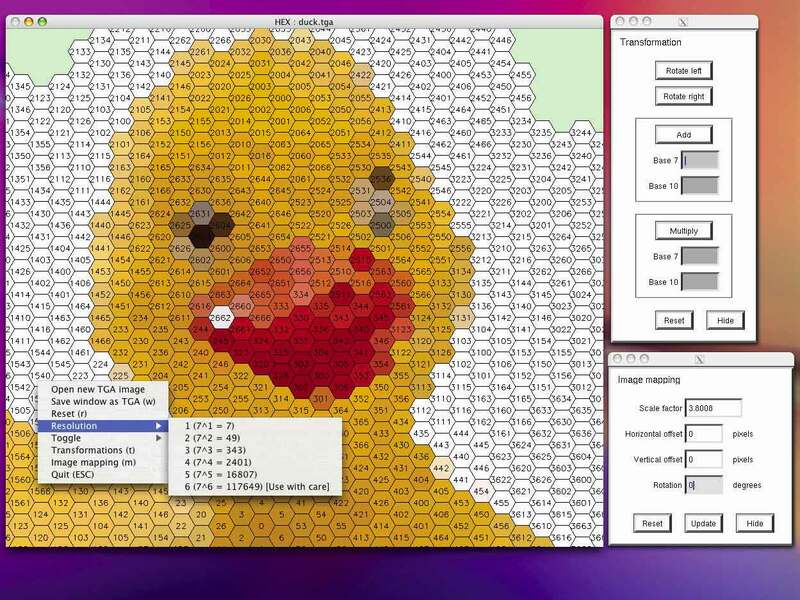 The interface is straightforward, to find out about any command line options type "hex -h". The left mouse button pans the image, the middle button rolls, and the right button presents a list of menu options. In order to position/rotate/scale the hexagon to the image see the image mapping dialog box. To experiment with SHM operations see the transformation dialog box. The two basic arithmetic operations can be defined for the SMH, addition and multiplication. 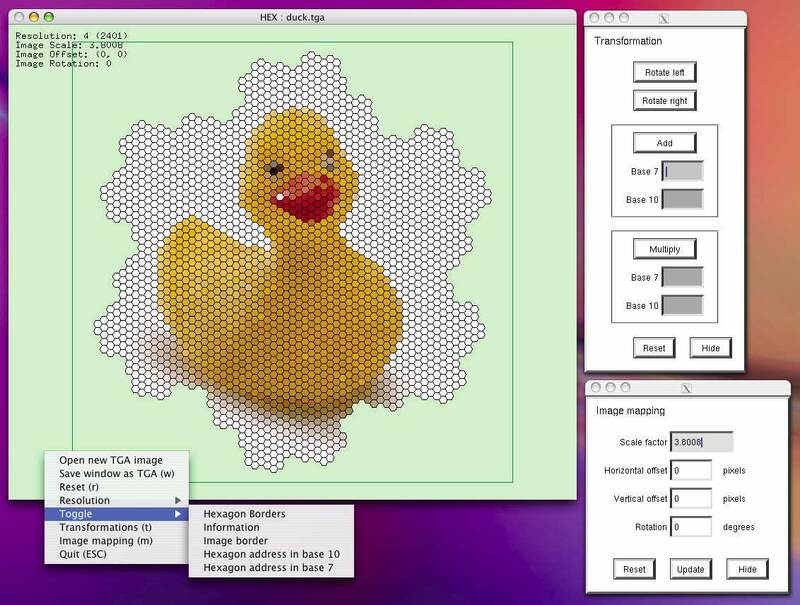 These operations act on the addresses of the SHM and result in translation (addition) and rotation/scaling (multiplication) when applied to images represented with the "pixels" of the SHM. The following two C snippets (HexAdd() and HexMul()) implement addition and multiplication. An important characteristics of the operations defined in this way is they are bijective, that is, it is a one to one mapping of each address. Every address (hexagonal pixel) maps uniquely to another address so that no information is lost. 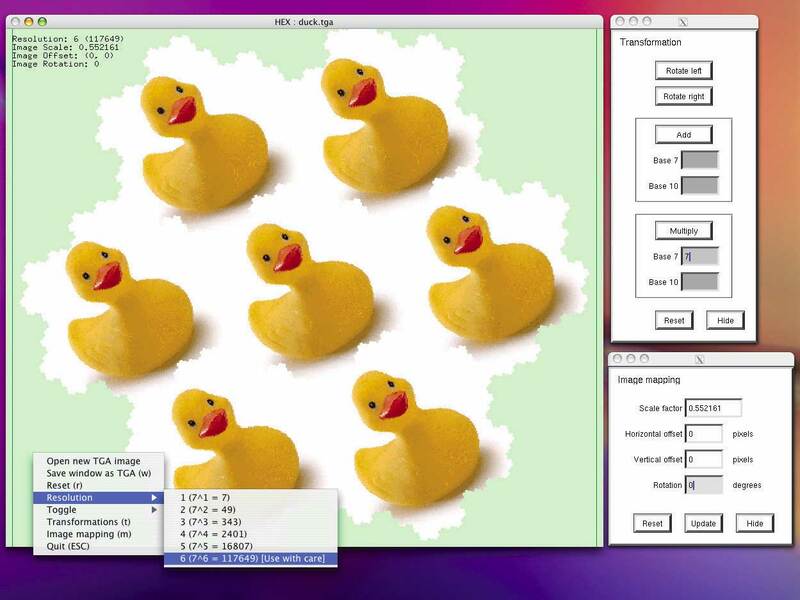 This is the same example at two powers of 7 greater resolution showing the "superduck". This example shows repeated addition by 6666hex. b = loge(sqrt(7)) / arctan(sqrt(3) / 2) = 1.3632084. The angle between each successive multiples of 10hex is arctan(sqrt(3) / 2) = 40.893395o, the ratio of two successive radii is sqrt(7) = 2.6457513. 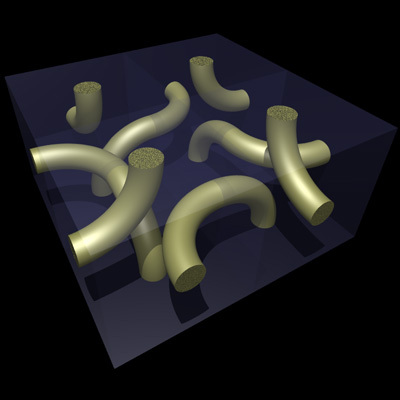 Alexander, D. and Sheridan, P.
Algebraic Geometric Model of the Receptive Fields Properties of the Macaque Striate Cortex. 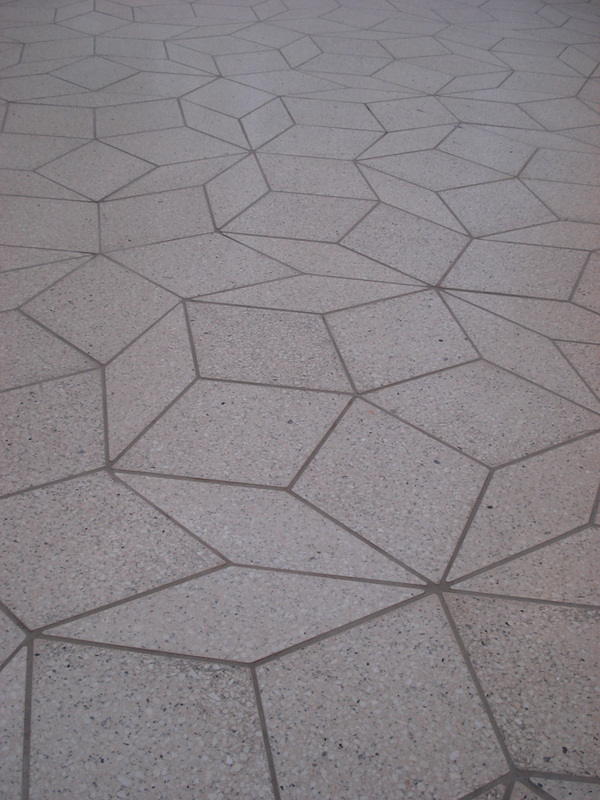 Sheridan, P., Hintz, T., Alexander, D.
eg: Penrose tiles, Danzer tiles, Chair tiles, Trilobite tile, Pinwheel tile. 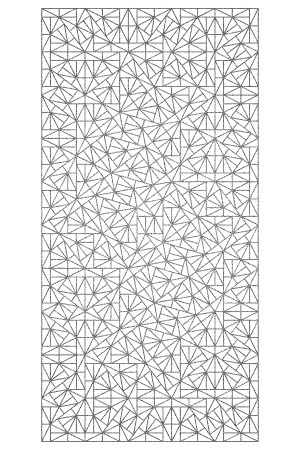 Tiling a plane with single geometric shapes is an old exercise in geometry. The platonic solids were shapes that tile 3D space using regular polyhedra, in 2 dimensions examples of regular polygons that tile (without gaps or overlap) the plane are the equilateral triangle, square, and hexagon. 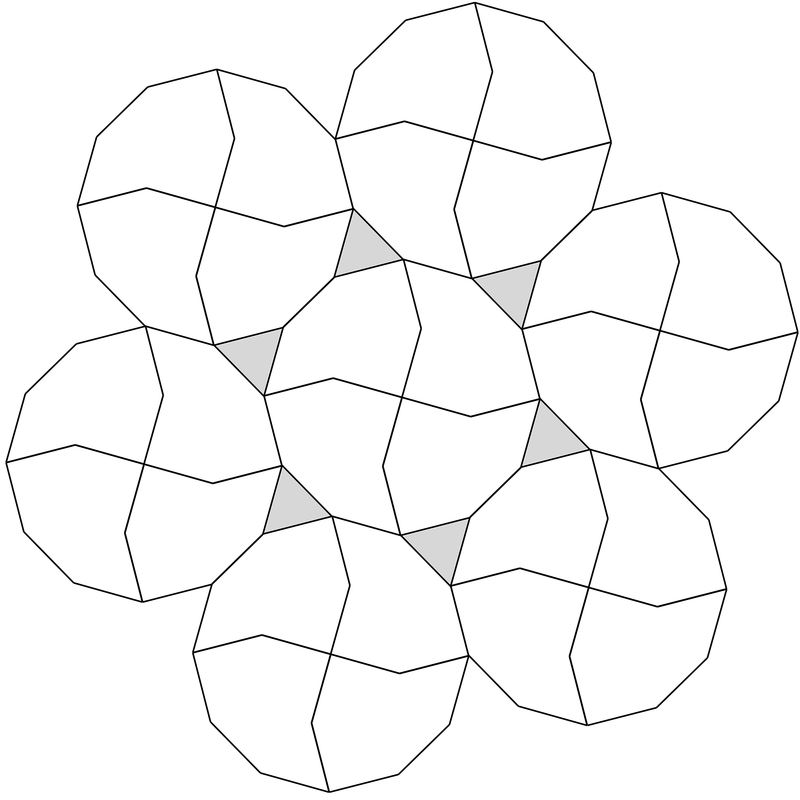 There are many examples of general polygons (not regular) that tile the plane, but in the most common cases they form periodic tiling. 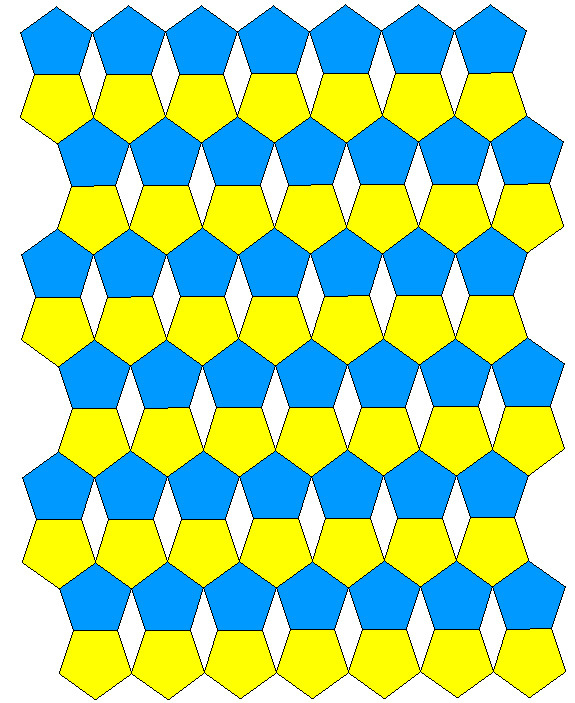 A periodic tiling is one where it is possible to make a parallelogram (generally larger than the tiles) that can be repeated to produce the same tiling. 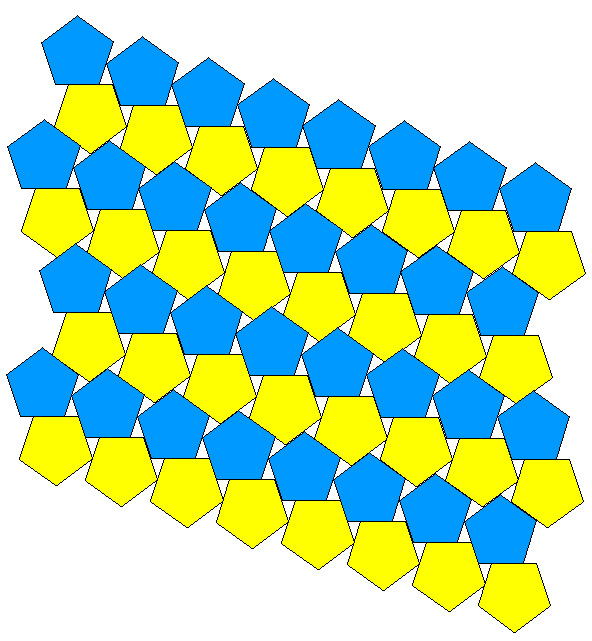 An example of the more common periodic tiling is shown below for two tiles (blue and yellow), the red boundary illustrates one possible region that can be replicated to create the same effect as the tiles. Note that in general the period forming shape need not be a rectangle but any parallelogram. Note also that there are generally a large, if not infinite, number of periodic parallelograms for a particular periodic tiling. 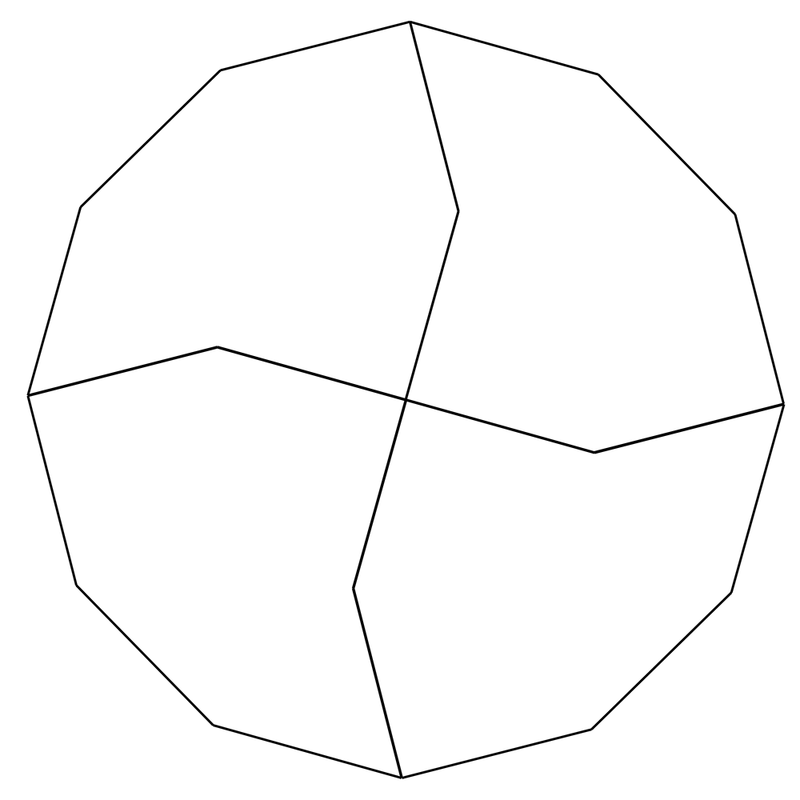 An example of a single tile that can tile periodically and nonperiodically is a decagon (ten sided) with a "bite" taken out of it. Tiles that can form both periodic and nonperiodic tilings are often referred to as "versatile" tiles. An example of this tiled periodically is given below. Note that for a tiling not to have holes all the angles at a vertex must sum to 360 degrees. 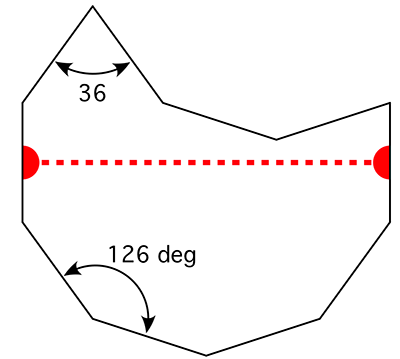 In this case each angle is either 72, 144, or 216 degrees. A number of combinations of these numbers can sum to 360. 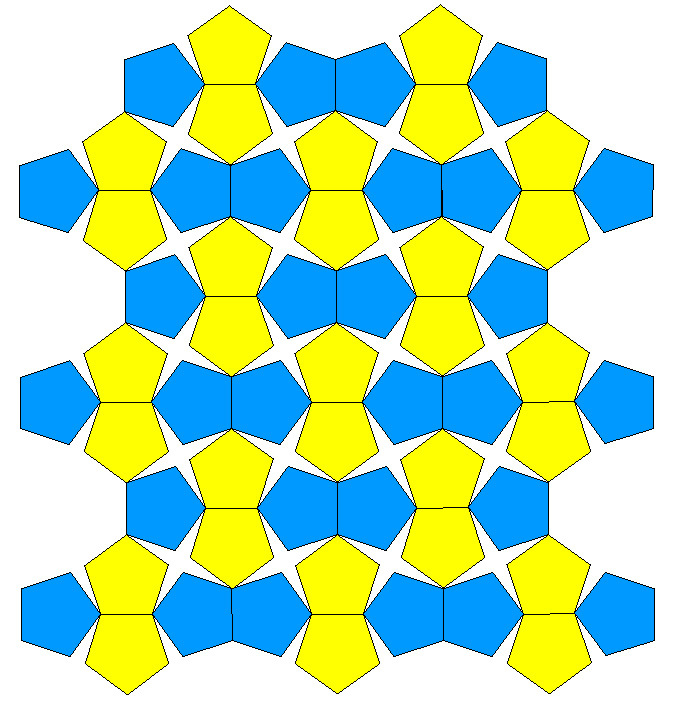 The periodic tiling as shown above have the decagons orientated in multiples of 180 degrees. If the decagons are rotated in multiples of 36 degrees (10 different orientations) the tilings can become nonperiodic as shown below. 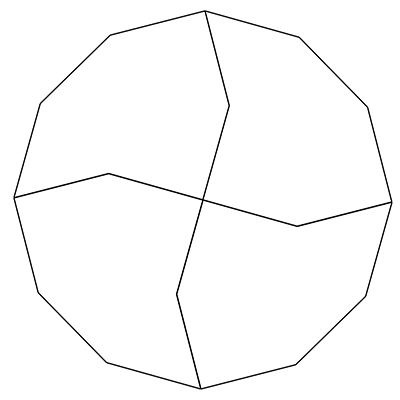 Some shapes that can be combined to form larger versions of themselves have an obvious nonperiodic tiling, for example the following is called the sphinx. A periodic tiling with the same tiles is obvious. How about purely non periodic tiling, that is, a set of polygons that tile the plane but never form a periodic tiling. 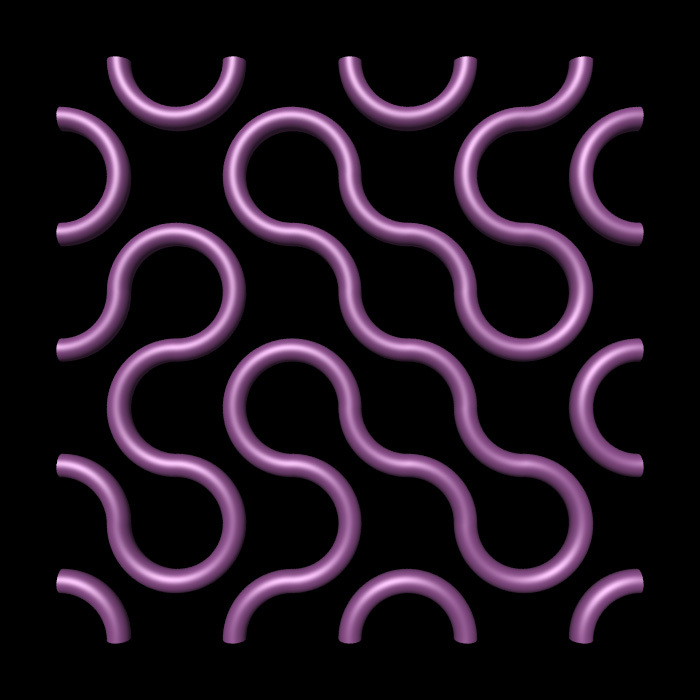 For quite a while it was assumed that any set of tiles that formed a non periodic tiling could also be used to form a periodic tiling. In 1966 Robert Berger showed that it was not possible to determine whether a particular set of tiles would tile non periodically! 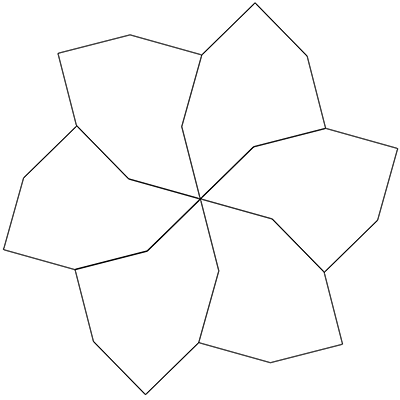 This following set of six nonperiodic tilings were "discovered" by Roger Penrose around 1973. It is illustrative to print and cut a few sets of these tiles out and "experience" how they tile the plane. The following six tiles are attributed to Richard Robinson who in 1971 reduced a 104 aperiodic tile set by Robert Berger (they were a reduction from a set of originally 20426) to just six tiles. 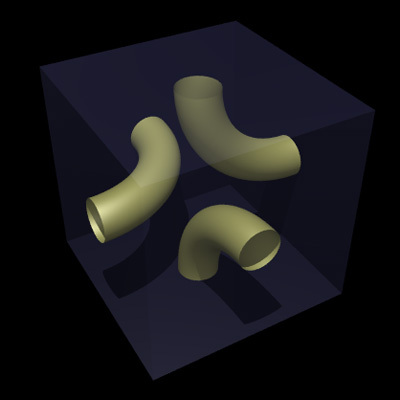 Around 1973/74 Roger Penrose found a set of two tiles that only tile non periodically. While these come in a number of forms the most common one is illustrated below. Note that phi indicated below is the golden ratio of (1 + sqrt(5))/2. The start of the tiling of these two tiles is illustrated below. The two tiles are often referred to as the kite and dart. The rhombus would of course tile periodically, the triangular pieces force a select combination of allowed connections. 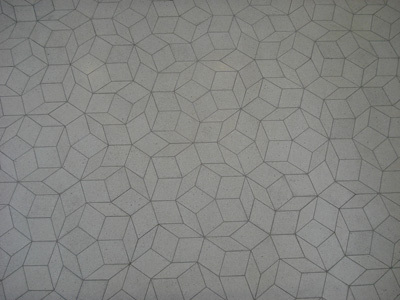 There are a number of elegant properties of this tiling. 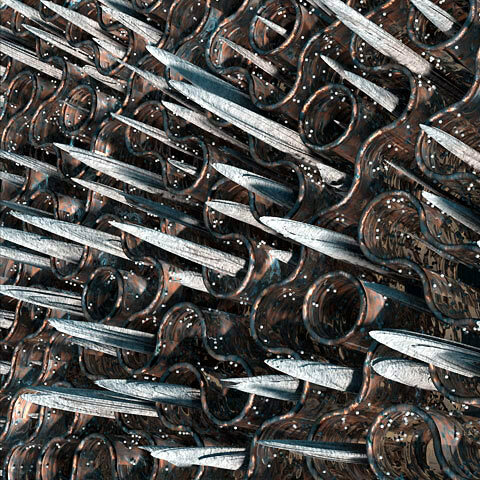 For example, the ratio of kits to darts in an infinite tiling is the golden ratio! 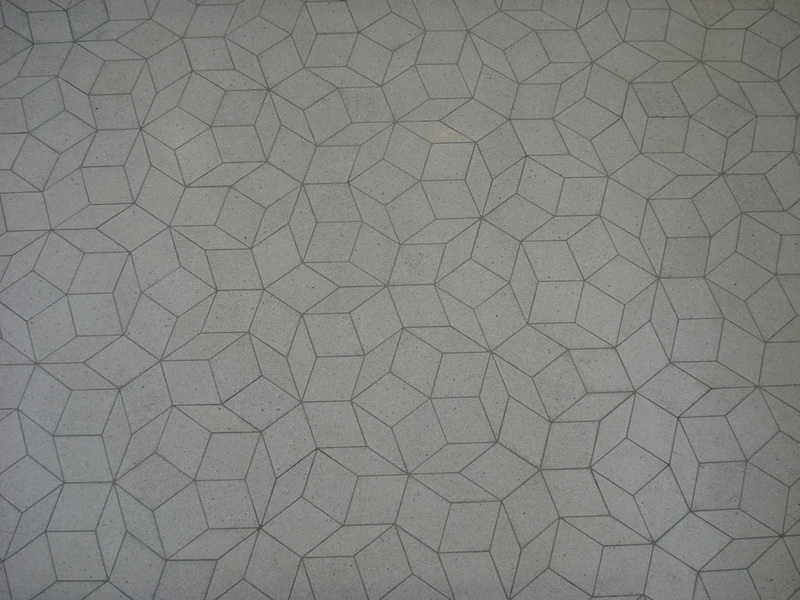 Floor of the Chemistry building, University of Western Australia. The three tiles making up the so called "Danzer" aperiodic tile are shown on the right. 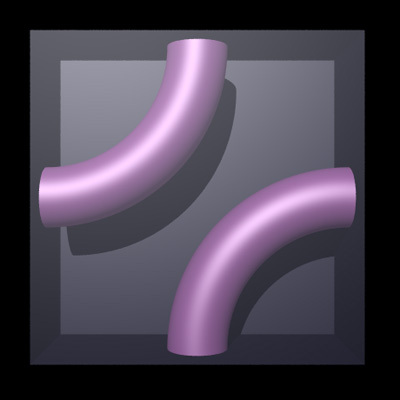 The rules for coincident edges are shown as edge direction markers, these must match before two pieces can be put together along a shared edge. 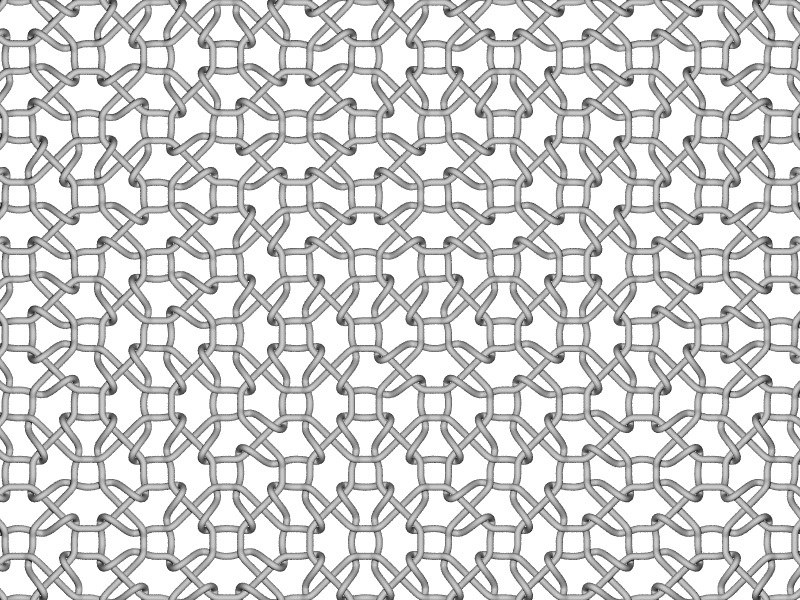 This tiling was initially thought interesting because it was one of the first found with a seven fold symmetry, something that for many years earlier was considered unlikely. Each of the tiles can be constructed from the three pieces, the first iteration of this is shown on the right. All three tiles are required in each case. 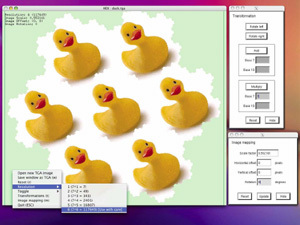 The second iteration (reduction scaling applied) is shown on the right. 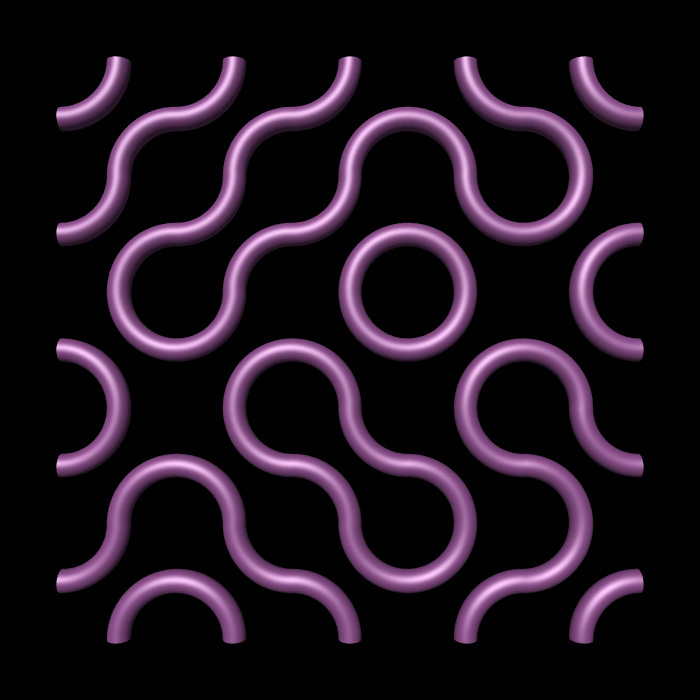 Note that with correct tiling no edges are bisected by other edges. The so called "chair tile" is formed by starting with the seed tile as shown on the right. The first iteration is formed by replicating the seed 4 times, one orientated the same way, one rotated 90 degrees clockwise and the other rotated 90 degrees anticlockwise. 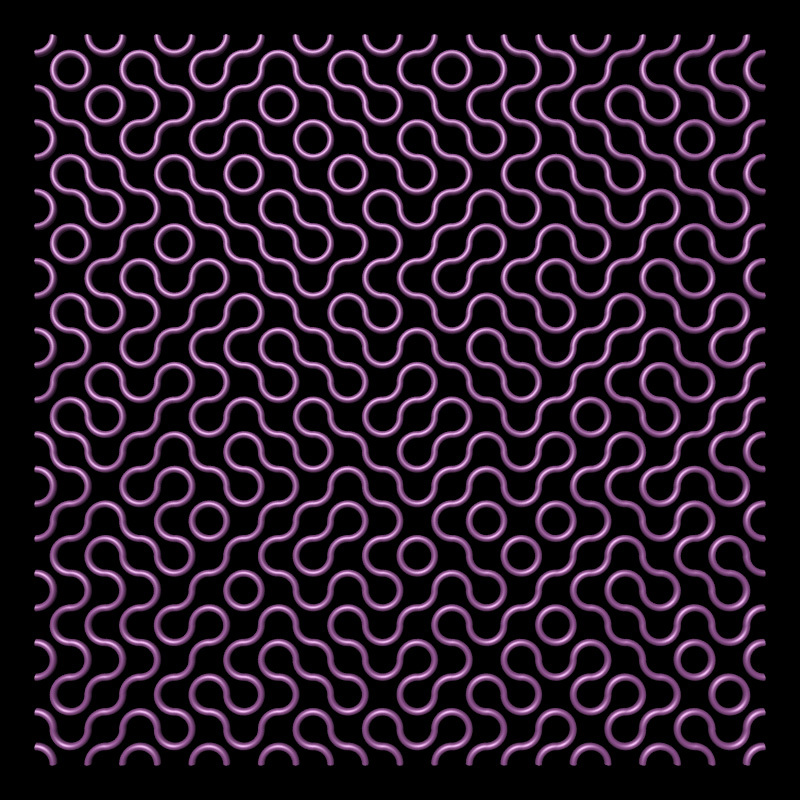 Subsequent iterations are formed by replicating and applying the rotations and translations to the last iteration. The size of the tile increases by a factor of two along each axis. 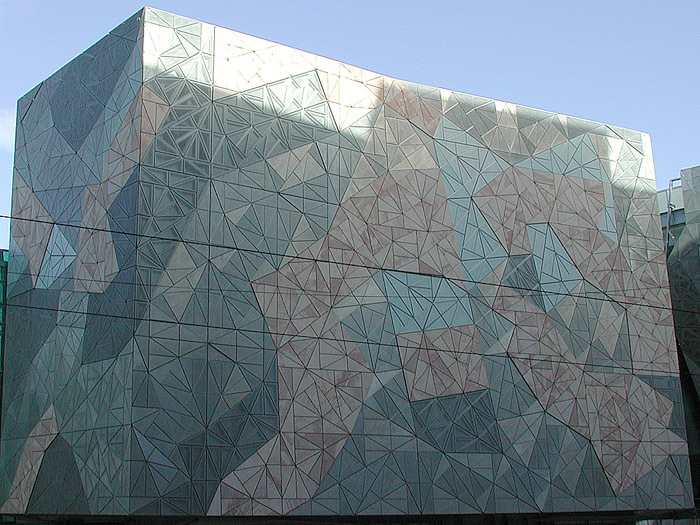 The tiles can be coloured in order to bring out some features such as the diagonal structure. The tile below is the fifth iteration using the coloured arrangement on the right. This tiling consists of two tiles called the trilobite and the cross. 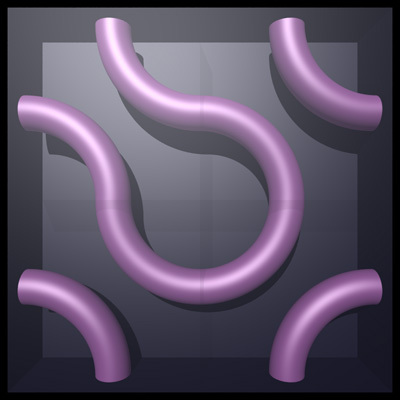 The tiling is only possible as an aperiodic tile, that is, there are no periodic tilings of infinite extent on the plane using these two tiles and the joining rule. The second tile, the cross, got its name because it and the trilobite is often drawn rotated by 45 degree to those shown here. The tips of two tiles can only be connected if the black and white strips align. 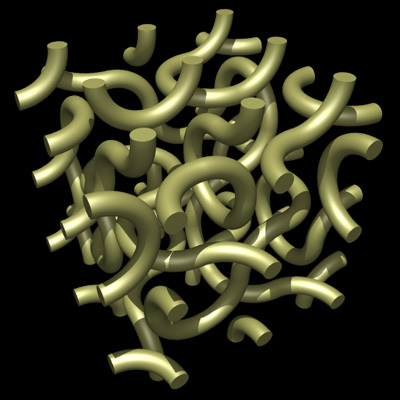 It is this constraint that forces the only infinite tiling to be aperiodic. Four trilobites can be connected as follows without the need for any cross tiles. 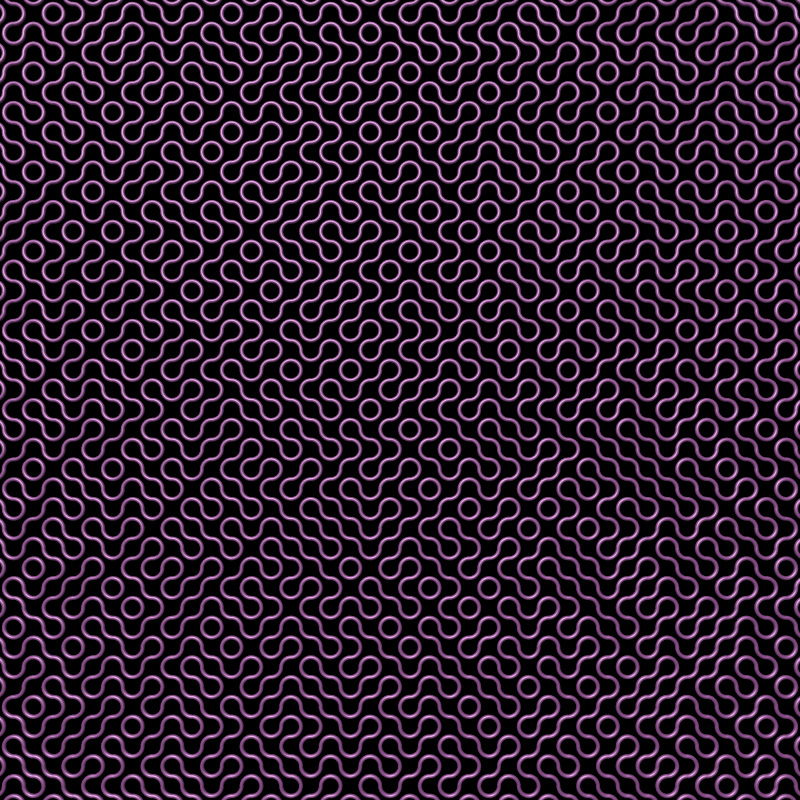 At each iteration the total bounds of the tiling increases by a factor of two. The next stage of the tiling can be constructed as in the chair tile. 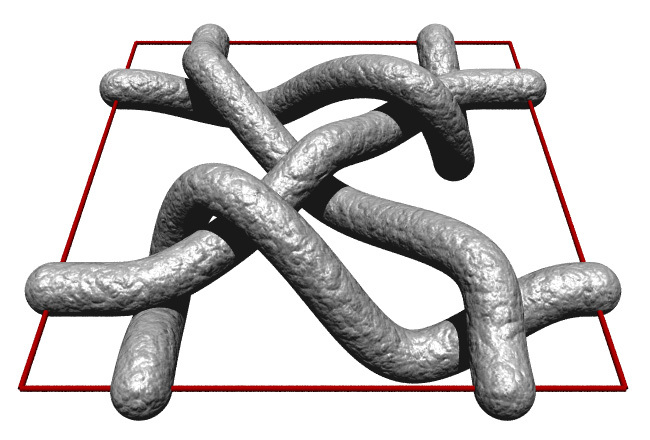 The result shown on the right is made up of 4 copies of the earlier stage, 4 cross elements are required to fill in the gaps. Note that one of the copies is only translated, one other is rotated clockwise by 90 degrees and the other is rotated anticlockwise by 90 degrees. The same applies for the filling cross tiles. The next stage uses 4 copies of the last stage with the same rotational and translation relationships as in the last iteration. The cross files required to fill in the holes are again shown in blue below. 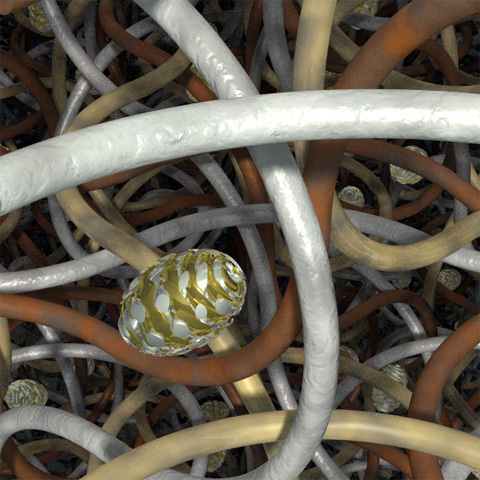 And finally the fourth iteration scaled down by a factor of 2. 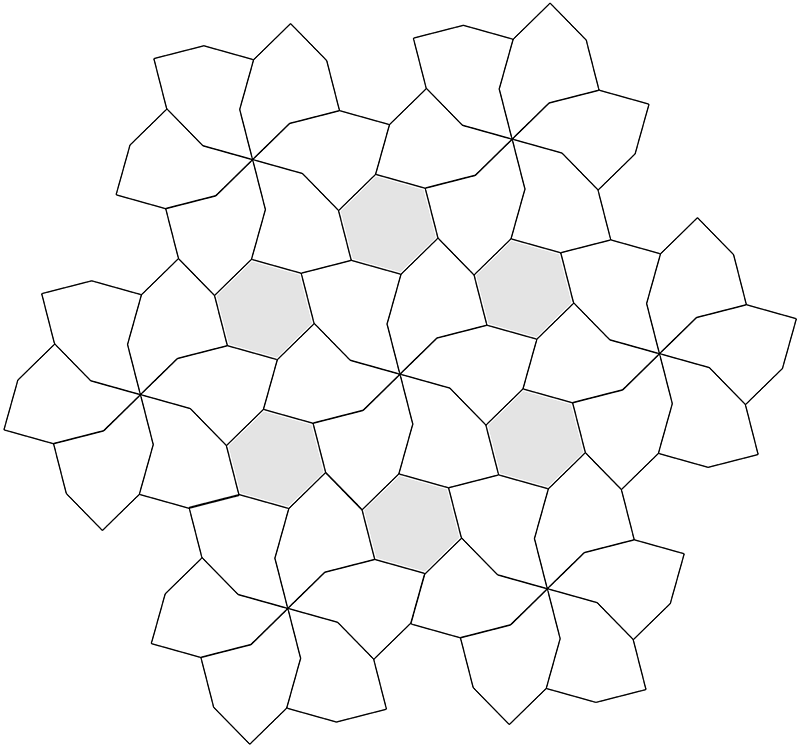 An iterative procedure for creating the pinwheel tiling is given below. This infinite tiling of the plane is known to be aperiodic, that is, there is no parallelogram shaped region that can be repeated to form the same tiling. The pinwheel tiling can be constructed by starting with a right angle triangle with side lengths of 1, 2 and square root of 5. 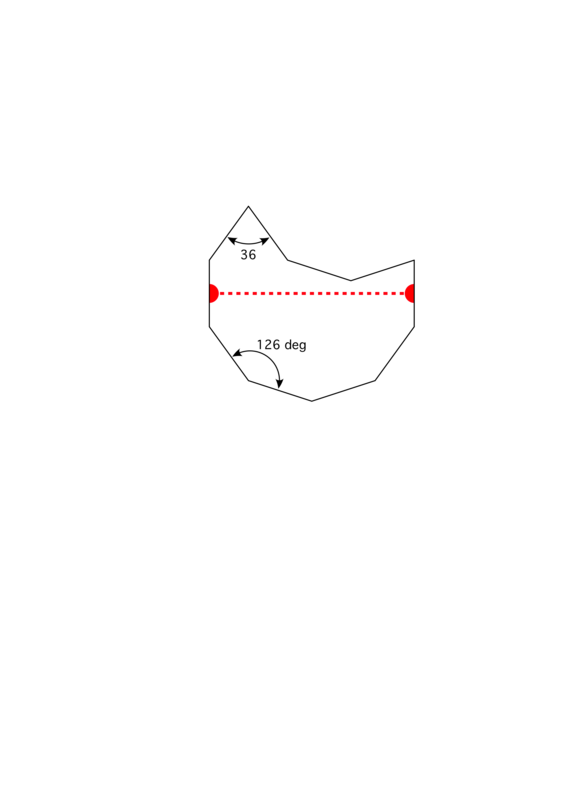 Five of these triangles can be rotated, mirrored, and translated to form a larger similar triangle as shown in red on the right. 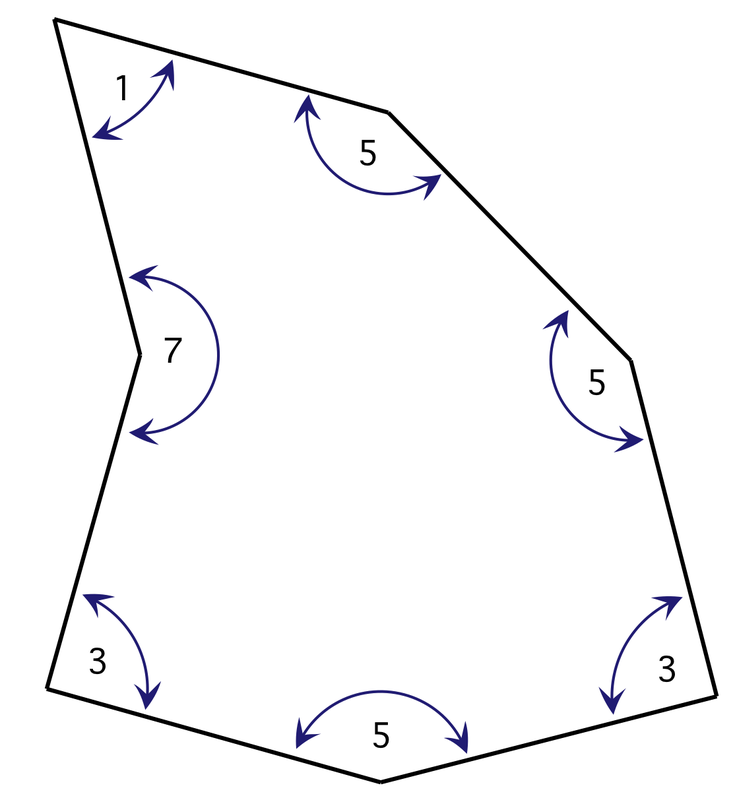 The rotation angles are one of the angles of the triangle, that is, atan(0.5), pi/2-atan(0.5), or pi/2 degrees. This process is repeated, on each iteration the global triangle increases in size by the square root of 5. Five copies of the last iteration are packed into the new triangle. The second iteration is shown on the right. From the right and top down the transformation for each triangle is as follows (leaving out the final translation). 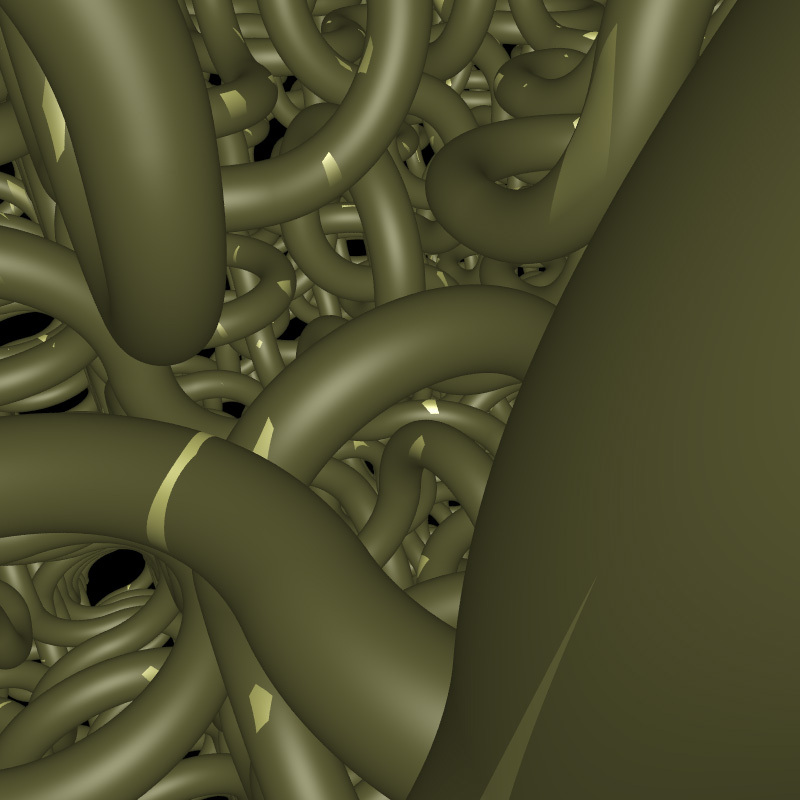 Locally one can pick out what seems to be regular structures but of course they don't form a larger regular tiling. 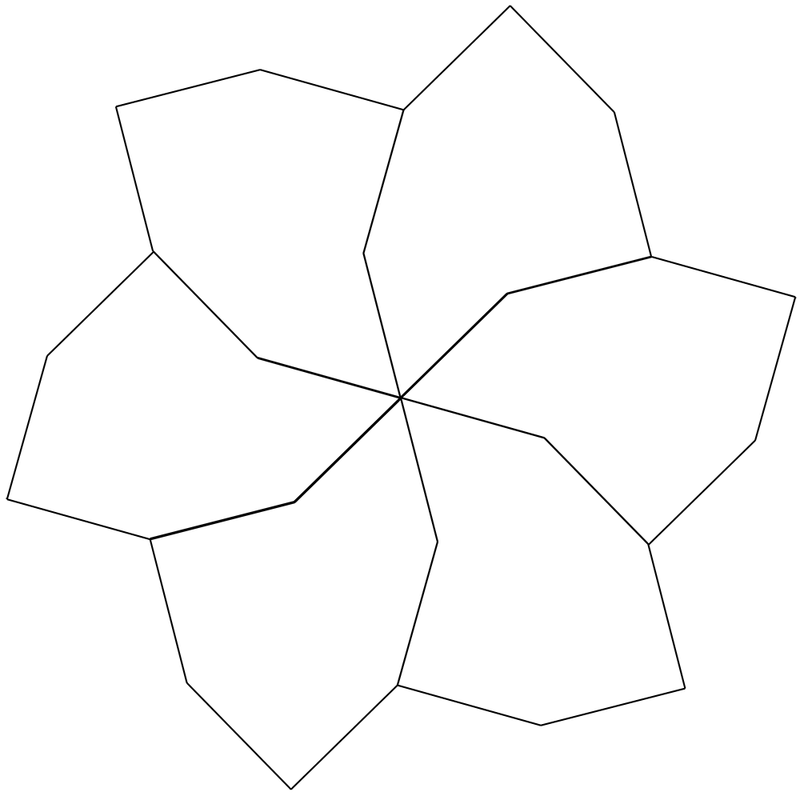 For example the groups of 8 triangles that share a single vertex can be readily identified, it is these "pinwheel" shapes that give the tiling its name. 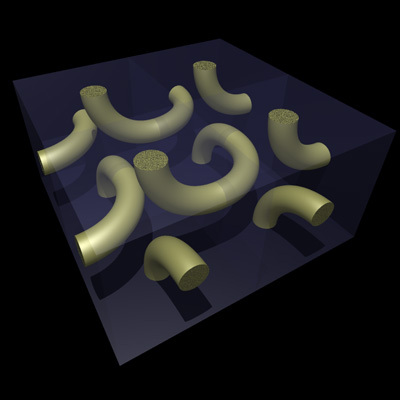 The properties of this tiling were discovered and named by Charles Radin of the University of Texas in 1991 and first published in 1994 in the Annals of Mathematics number 139, page 661-702. 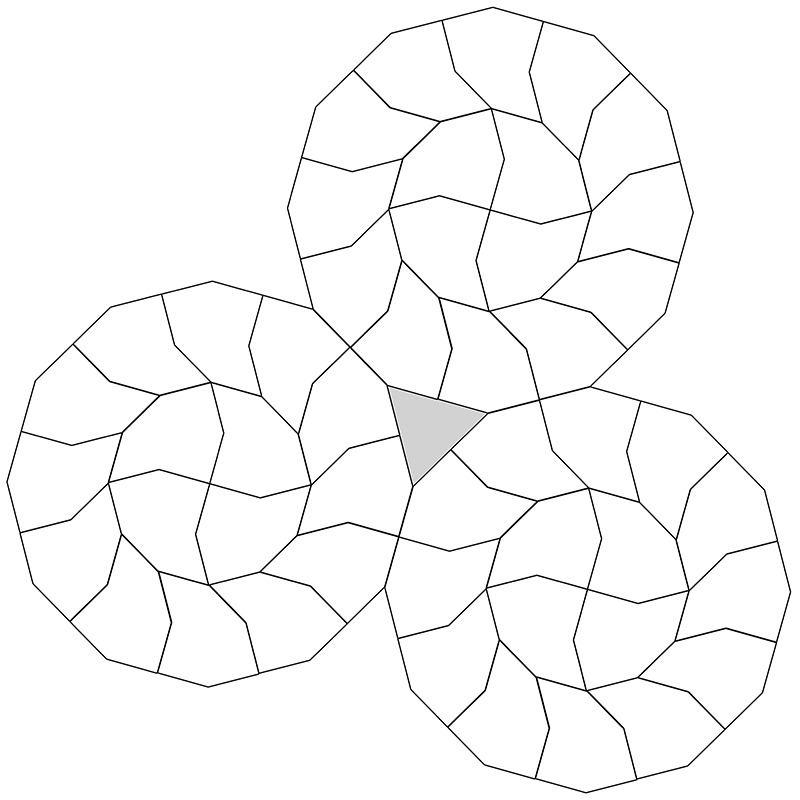 In this case the tile has been scaled down (click on the image for a larger version) and another triangle is used to form a rectangular region. A periodic tiling is one where it is possible to make a parallelogram (generally larger than the tiles) that can be repeated to produce the same tiling. 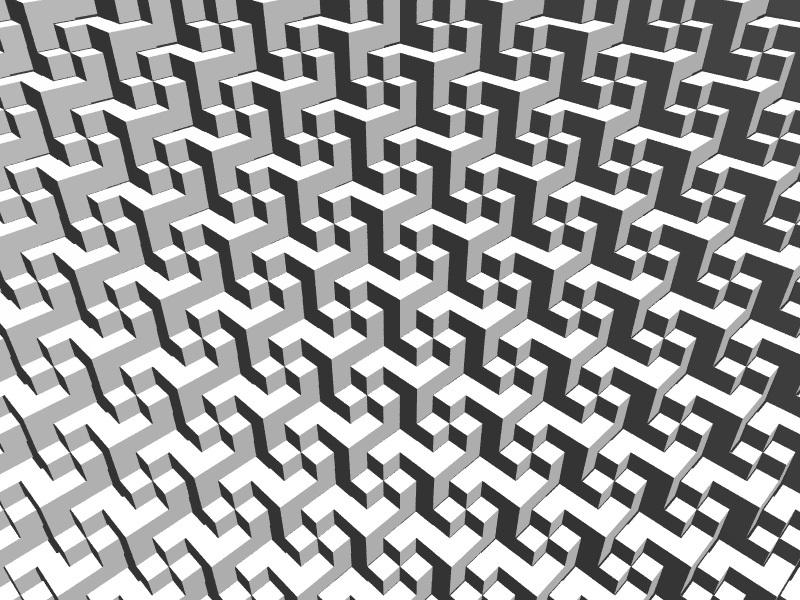 Continuing this iterative process results in an infinite tiling on the plane that is never periodic. 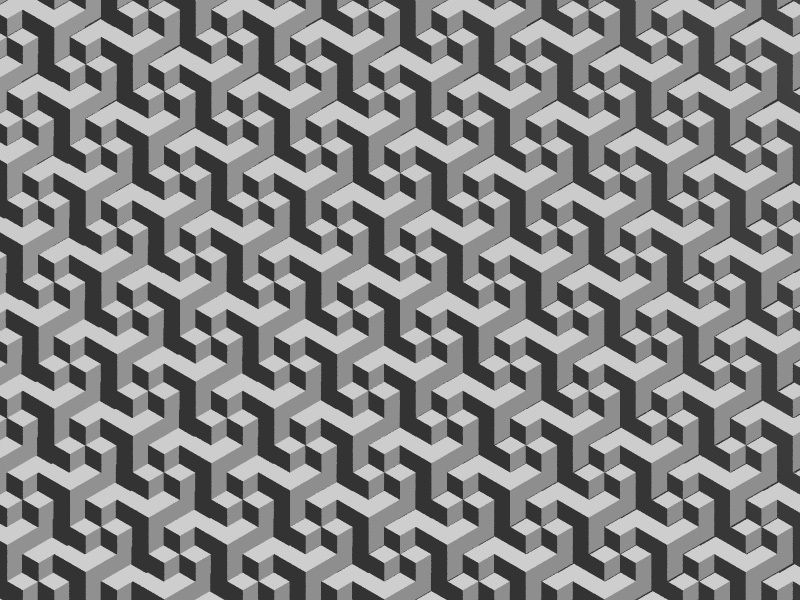 Note that forming a larger tiling by repeating this rectangular shape obviously isn't appropriate, the tiling would then no longer be aperiodic! 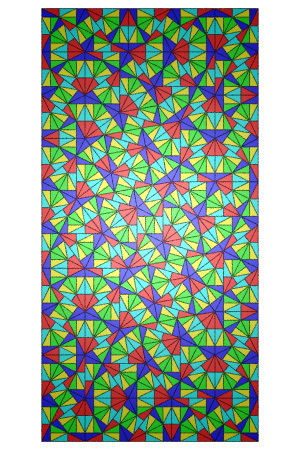 The lack of periodicity can be highlighted by colouring each triangle as shown below. 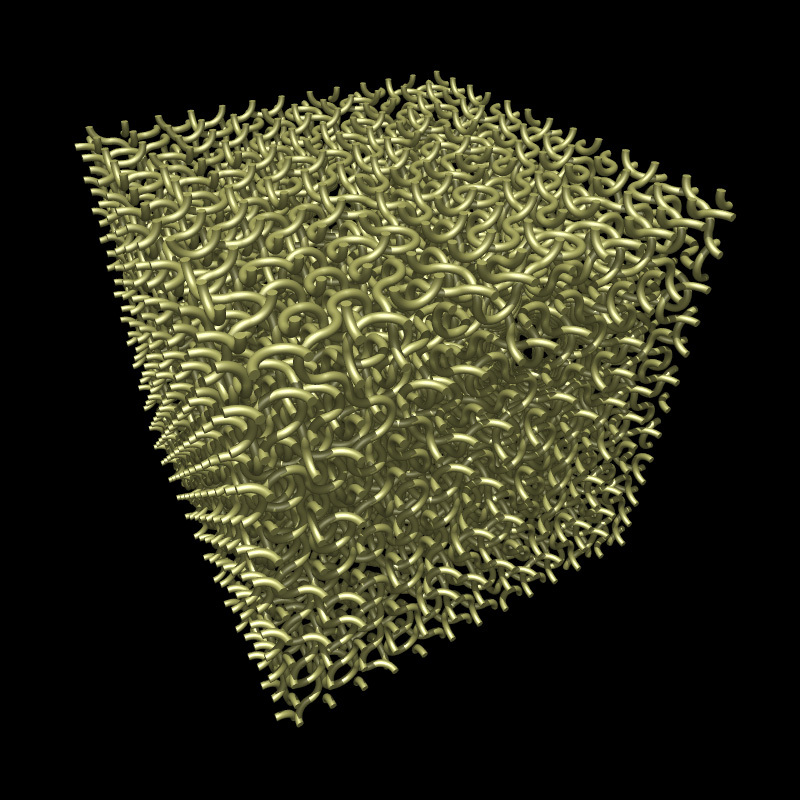 The human visual system and brain are good at picking out patterns, and while there often seem to be small scale patterns they don't persist at larger scales. 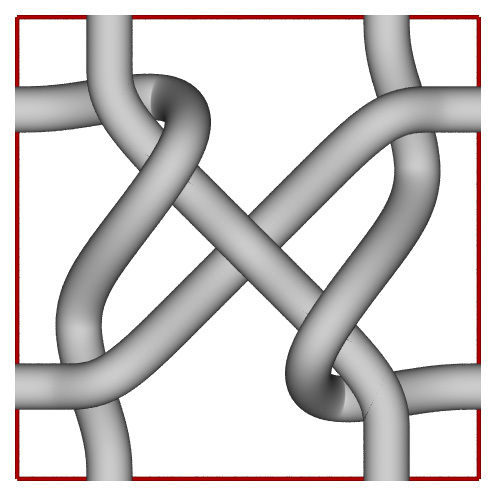 The basic tiling unit is shown below, the constraint is that two semi circles cannot be placed adjacent to each other. All angles are integer multiples of 36 degrees, similarly rotations of the tiling unit are also multiples of 36 degrees. All edge lengths are equal. A legal tiling might be as follows. Question: can this tile the plane indefinitely? 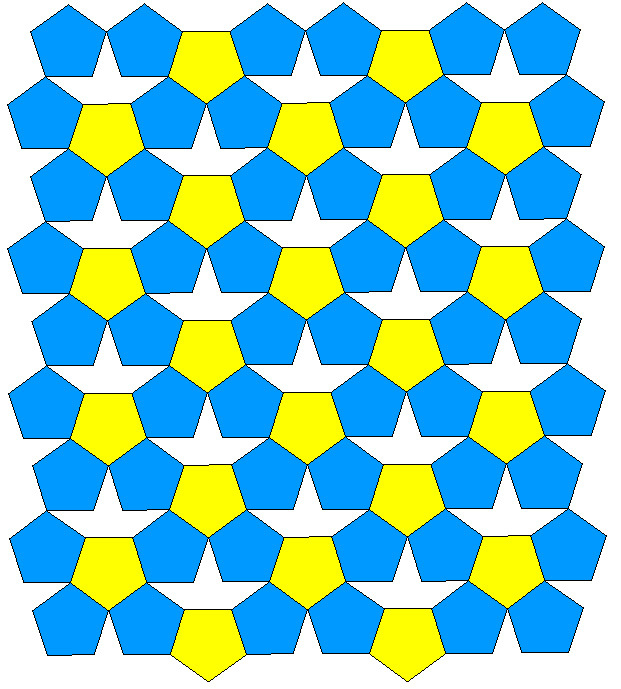 The basic tiling unit is shown below, the internal angles are integer multiples (as shown) of 30 degrees. All edge lengths are equal.